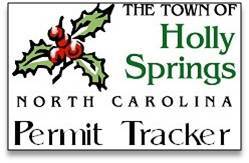 Welcome to the Town of Holly Springs Permit Tracker. The Permit Tracker allows applicants and citizens a convenient way to check the status of Unified Development Ordinance (UDO) Permits. The database can be searched by permit number or service address. Click on the Permit Tracker icon to get started, use the Public Information Search. Typical turn-around time for a UDO Permit is approximately five (5) to ten (10) business days. This database contains all UDO Permits submitted to the Department of Planning & Zoning from September 2009 to date. To inquire about a permit submitted prior to September 2009, please contact the Department of Planning & Zoning at (919) 557-3908 or via email.